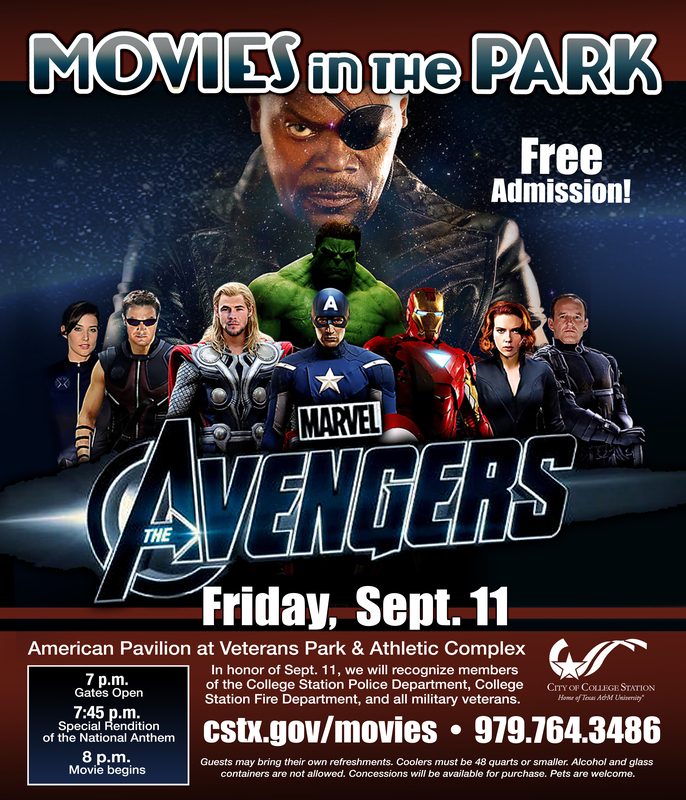 Join us Friday night at the American Pavilion in Veterans Park & Athletic Complex for a free showing of “The Avengers” on our big screen. Bring your friends, family, blankets and chairs for an evening of family-friendly fun. We’ll also be honoring our national and local heroes who fight for our country overseas and protect and serve us at home. Representatives of the College Station fire and police departments will be on-hand when the gates open at 7 p.m. to give inside looks at their vehicles and equipment and answer questions. Veterans Park also is home to the Brazos Valley Veteran’s Memorial, which recognizes and honors the service and sacrifice of America’s veterans. A special rendition of the national anthem is scheduled for 7:45 p.m., followed by the movie at 8. You’re welcome to bring coolers 48 quarts or smaller, but alcohol and glass containers aren’t allowed. Concessions will be available for purchase. For more details, visit cstx.gov/movies or call 979-764-3486. This entry was posted on September 4, 2015 by City of College Station. It was filed under Parks and Recreation and was tagged with movies in the park, veterans park.